During this time we have created an excellent working synergy within our General Committee, with every member taking on responsibilities in line with his or her own personal and professional experience, and this has helped us to get in touch with all aspects of our organisation. We have also improved the connections to our sections, thanks to the leadership and dedication shown by their respective chairs. Another thing we have done is to identify countries where dog breeding is currently emerging and we shall be helping them and guiding them in their work in order to protect dogs, issue their pedigrees and develop canine sports and activities endorsed by the largest canine organisation in the world, i.e. the FCI. 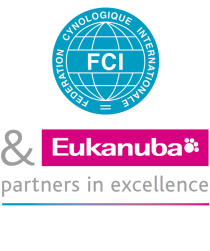 In preparation for the changes which we shall be starting to see at the start of next year, we have improved our communication, with the aim of keeping both our members and the international canine community informed of the work that the FCI is doing every day. In the same way we have optimised the capacities of the various departments within the FCI in order to improve the service we offer our members. At the same time, we are working both to update and modernise our online digital platforms and to make them into a forum for the exchanging of knowledge and experience, where the common subject is dogs, their health and well-being. In addition to this, thinking ahead to how the FCI is likely to grow in the future, we are embarking upon the expansion and modernisation of our headquarters in Thuin, with the construction of the annex which will house an advanced canine research and study centre, a library, offices and the Dog Museum. In order to achieve all of this and more, it is essential for us to have our members’ support and advice, and so - for the first time ever – we have consulted all our members directly, asking for their opinions about the FCI, about how we can improve bilateral relationships and, even more importantly, about how we can improve the relationships between the FCI and dog lovers in their respective countries. There can be no doubt that dogs can help to bring about cultural unity and we need to look after their well-being and ensure that they are properly protected. With this in mind, we have embarked upon a series of meetings with organisations which do not belong to the FCI but which, like ourselves, love and value dogs. Last November we had our first meeting with the British Kennel Club and we will be meeting both the American Kennel Club and the Canadian Kennel Club in the first week of 2014. With this edition we are celebrating the end of a year of changes, challenges, joys, sorrows and satisfactions, but we feel sure that we have all worked together on behalf of the FCI and dogs all over the world. With this edition, we are also starting a new year in which we promise to work even harder to protect the animals which look after us, help us, cheer us up and keep us company. On behalf of all my colleagues on the General Committee of the FCI and all members of staff at the FCI’s central offices in Thuin, I would like to wish you a Merry Christmas and a Happy New Year!